Being gluten-free is most challenging when you don't have control over how the food is made. Okay, so I can't help you with the last one, but restaurants are coming right along! More and more have gluten-free menus, and many have knowledgable waiters and managers. But what about Italian restaurants? Pasta, pasta, pasta. Pizza, pizza, pizza. Foccacia. Crostini. Ciabatta. None of those are gluten-free in their original form. 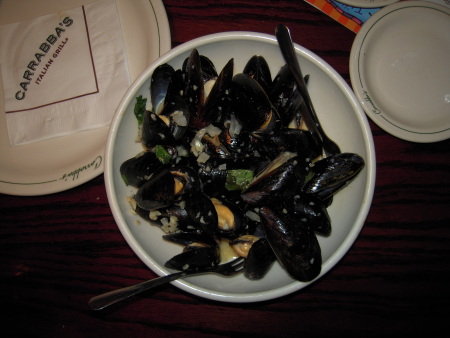 But just because I can't have those things, that doesn't mean I can't enjoy an Italian dinner out with my family. 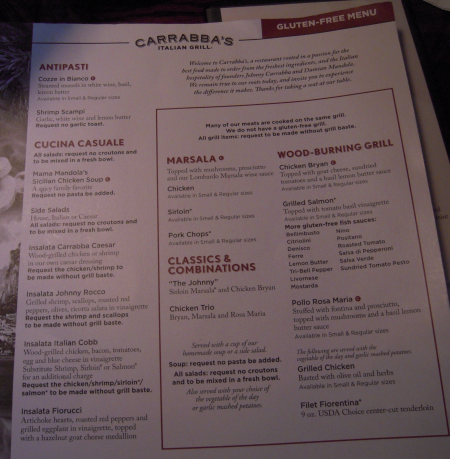 I have no trouble getting my family to go to dinner at Carrabba's. They love the Italian food, and I love the gluten-free options. This is their gluten-free menu. You can get salads, but there are also main dishes. Last time we were there, I ordered a gluten-free appetizer for my main course. But one taste didn't seem to be enough for them. I had to defend my own gluten-free main course from invasion! 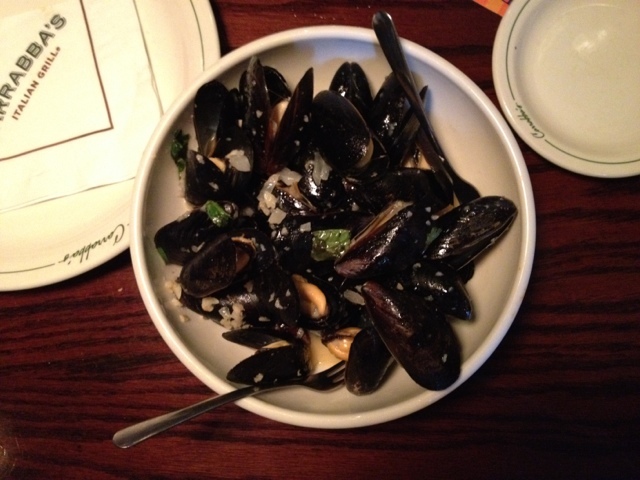 I ordered the mussel appetizer as an appetizer for everyone. Gluten-free for everyone! These went down in record time. For my main course, I ordered a salad. But not just any salad. This is the Insalada Fiorucci. 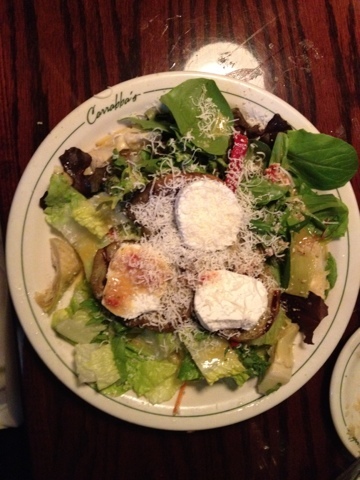 Eggplant and goat cheese. Why is it that I love goat cheese so much? I get the feeling that this is not a common sentiment. This is called "John Cole". I have no insight into the name, but it is gluten-free and fabulous! Specifically, from the menu: "Vanilla ice cream with caramel sauce and roasted cinnamon rum pecans." Did you notice the four, long-handled spoons... yeah, my family members were willing! Everything was tasty and good. And safe for me. And good for everyone else. What more can one want? Good food for everyone!